We had a snow day yesterday and it gave me the opportunity to experiment with green banana flour and come up with these chocolate banana walnut bites. I’ve known about green banana flour for a while, but kept forgetting to order some and try it out. Then, I conveniently stumbled upon it at the grocery store. Score! So far, I am pretty impressed with the flour. It worked well in this recipe and did not yield a strong or sweet banana flavor. It’s actually rather subtle. All in all, the bites turned out intensely chocolatey, subtly sweet, and slightly crunchy. 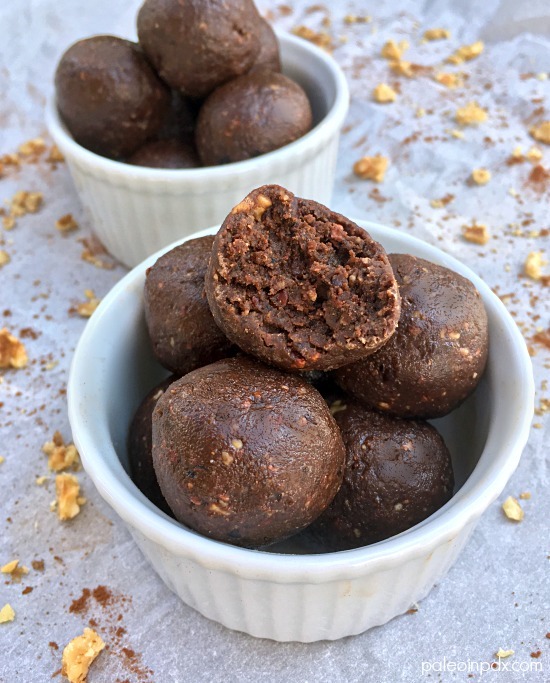 In addition to the wonderful flavor, you get a dose of antioxidants, healthy fats, and resistant starch in these decadent bites. Perfect little treat. Also, if you’re wondering, resistant starch actually, “resists digestion” and feeds the healthy bacteria in the gut. This can lead to improved blood fats, better insulin sensitivity, increased satiety, improved digestion, and more. Cold cooked white potatoes, fresh green bananas, and green plantains are other great sources. If you want to learn more about resistant starch, visit HERE. Combine all the ingredients except the cacao nibs in the food processor. Process until mixture is well blended and clumps together. Add the cacao nibs and pulse a few times to incorporate. With hands, roll mixture into tablespoon-size balls and place in the refrigerator to set for 10-20 minutes. Banana flour is one of the few flours I have yet to try!! this looks like a good reason to get it done finally! I need to experiment with it more, but I really like it so far! This was my first time trying it out! 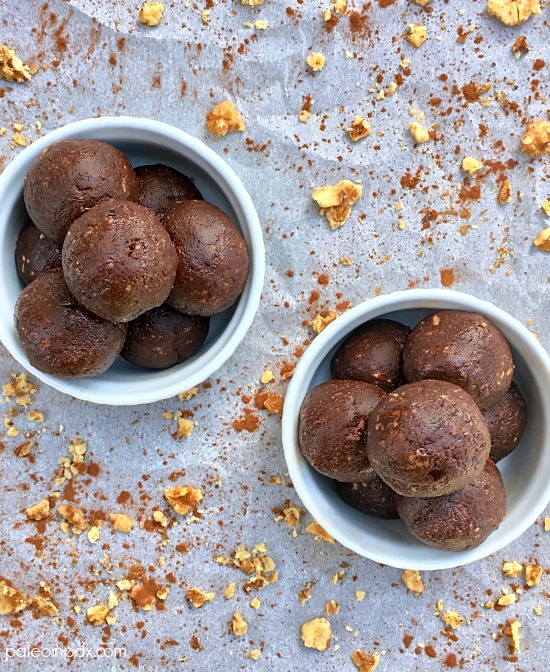 To get that subtly sweet, banana “aftertaste” in these still-resistant-starch bites, Alisa, would it be possible/prudent to add a drop or two of an EO that would mimic or actually provide a banana flavor? And, if that scenario is safe and possible, do you carry such an EO? It doesn’t really seem necessary, in my opinion. The banana aftertaste isn’t sweet since it’s green banana flour, so you’re not missing out on subtle sweet. It just tastes a little like green banana. No essential oils that mimic that flavor either. The subtly sweet in these comes from the dates.